Having a little trouble with my truck today. I went to start it up to head to class and she wouldn't crank. I had lights but no crank. I took the battery to the auto parts store and it tested good, so I got a starter to throw in. Old one was original to the truck anyways and I've been meaning to replace it for a while. After putting in the new starter, I'm still in the same boat. I can hear the fuel pump when I turn the key. I'm not sure where to go from here. I jumped the starter with a screwdriver and got the truck running. Once it's started, it runs and drives perfectly fine. So, I guess the starter isn't getting signal to crank? I've searched through my FSM but haven't been able to find troubleshooting for a no crank condition. What systems have to communicate to send the crank signal to the starter? Edit: Might be worth it to mention that twice last week, I had the same no-crank issue, but I was able to start the truck both times after waiting a couple minutes and trying again. I have not been able to crank itself since yesterday morning. I discovered something tonight which may or may not be related to the no crank issue. Over the past couple of weeks, I thought I've been seeing my headlights occasionally dim ever so slightly for a split second, but it was never dimmed enough or for long enough for me to say it was a problem and not myself going crazy. On my way home from work tonight, multiple times lasting upwards of 10+ seconds, my headlights dimmed almost completely out, my wipers slowed to a crawl, and the radio cut out. Dash lights also dimmed extremely. However, the engine was not effected. I could drop a gear and do pulls perfectly fine, while not having lights, wipers, or radio. One would think that, being a connected system, that the spark would cut out if the rest of the power cut out. I still haven't figured out the no crank situation, and I'm not sure if these two issues are related or not. Any thoughts or ideas? Since it is an S10 the first thing I would check is all of the cables connected to the battery on BOTH ends for a loose connection or rust or corrosion. Could be a simple as a cable getting loose or rusty. Quite common. The ignition draws no where near the current required by the starter. Sat here and thought about it for a bit, and decided that I should probably take the alternator to get tested in the morning and that the two issues are likely not related. Definitely wouldn't hurt to take a wire brush to the cable ends. But, if the starter wasn't getting enough current from the battery cable, wouldn't jumping the starter not work? if the starter wasn't getting enough current from the battery cable, wouldn't jumping the starter not work? That does sound more like your starter solenoid is going. Sometimes it works, sometimes not is telling you it's time. But before you spend the bucks check the cables. I've already replaced the whole starter unit. Those would be the first to wires to check. That small one breaks right at the terminal a lot during R&R. Have you tried pulling up on the brake and clutch pedal when it won't start. Either of those safety switches could be going bad. 1st gens didn't have a very sophisticated starter wiring system. Thursday after class, I jumped the starter, and it wouldn't stay running long enough for me to get back inside. It sounded fine when it started, didn't sound like a miss or anything. It was as if the key got turned off and the engine was shutting off. Got it towed home (thanks AAA) and got to work cleaning the ground and power connections, as well as checking the small wire on the starter. Everything seemed ok, but she still wouldn't crank. Did some thinking and the only thing I could come up with was the ignition switch. I thought perhaps the crank position on the switch went, and then maybe the run position followed or is on its way out. The new switch came in today, and after replacing it, I'm still in the same no crank boat. If you have checked the safety switches I guess it's time to try another starter. Did some poking around with the multimeter today. 12.4 volts at the battery. 12.4 volts at the power to the starter. 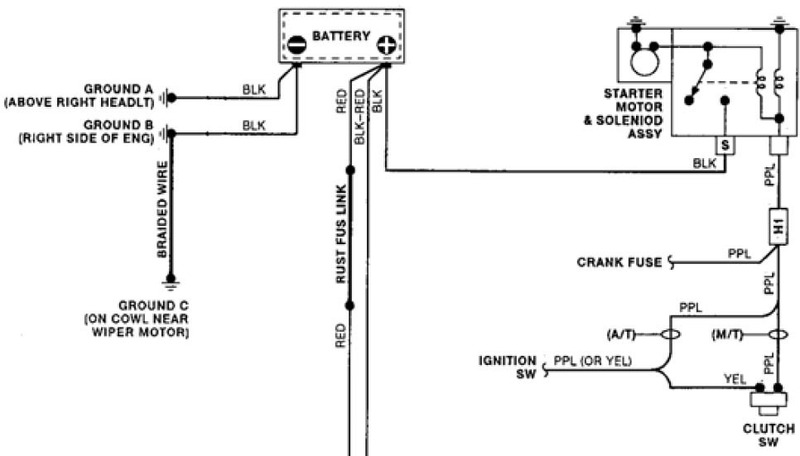 .03 volts to the starter signal wire with someone inside turning the key. I'm guessing it's supposed to be 12.4 volts. I followed the signal wire to the firewall where it enters the cab and it looks fine, I couldn't find any broken insulation or the like. I tried cleaning the ring connector with a wire brush and still only read .03 volts. Might end up taking it to my mechanic this week if I can't get it sorted out. I cut the connector off and had nice shiny copper behind it. Stripped some back and tested with the multimeter, and I'm still only getting .03 volts. I see there's a 3 amp ignition fuse, which I tested and is good, is there a starter relay somewhere? should be on firewall- what year? 91 no starter relay. Solenoid does the same thing. I found a short coming from the starter solenoid. Also I bought some good battery terminal clamps and made solid connection to the wires and she's all better. Care to tell us more about that? Pics? Sounds related. Is this truck auto or stick? If it's manual check the clutch safety switch. After thinking about this for awhile, if there was a short to ground back in Jan. anywhere along that purple wire from the Ignition switch to the solenoid it's a very real possibility that somewhere inside that wire or at a connector the actual copper strands are all but melted away. I'd try running a new wire as heavy or heavier than the original from the ignition switch terminal S to the solenoid. Bet that cures your problem. You could try a long jumper with alligator clips first to test the theory. I don't recall having a short from the solenoid in the past, are you sure that was me? I suppose it wouldn't hurt to try running a new wire from the solenoid to the switch to find out if the the wire is fried somewhere. I'm probably mistaken. Thought that was You. Sorry. But yeah, it wouldn't hurt to just bypass everything and see. Still nothing after running a new signal wire to the starter from the switch. A friend of mine noticed that when the key is in accessories (not run), there's no dash lights or radio. I don't typically sit in my car with it off so I wouldn't have noticed this before, but he said that I'm supposed to have dash lights and radio power in the run position, and that it could be the ignition rack. He's not a Chevy guy so he didn't know specifics about it, and the only thing a Google search found is a Dorman ignition rack for C/K trucks. Does anyone have any information about them for the S10s? My factory service manual doesn't mention an ignition rack from what I've found. The only mention of an ignition rack I've found in the FSM is a passage below "Ignition Switch Replacement" that says "The switch is actuated by a rod and rack assembly. A portion of the rack is toothed and engages a gear on the end of the lock cylinder. This enables the rod and rack to be moved axially (with respect to the column) to actuate the switch when the lock cylinder is rotated". I've managed to find a few of these racks for first gen S10s, but they all say they're for tilt-columns only (mine is standard column, manual transmission). I have no dash lights or radio with the key in accessories, full lights and radio with the key in run, and no crank with the key in start. Anybody know anything about these racks? That "rack" is internal part of the ignition switch. The one at the base of the column. When you turn the key the key cylinder rotates and slides the rod forward or backward to make contact with various contacts inside the switch. They have been known to fail. The whole assembly is available from Rockauto cheap. w or w/o tilt. It's also possible the rod is slipping or the switch is out of adjustment. The bolts holding it to the column fit into a slot on the switch. So it can be moved a little. 3 other cars in my household broke down in one day, making fixing at least one of them a priority, so I finally got this truck fixed up. The no crank and intermittent loss of electrical power while driving were two separate issues. I decided to replace the new Duralast ignition switch with an AC Delco switch. The AC Delco was actually cheaper off Rock Auto than the Duralast one was from AutoZone. With the new switch in, she cranked, but still suffered the random loss of electrical power. The battery light on my dash came on, but the battery was losing voltage while running. The alternator was only 2 years old, but it tested bad at the auto parts store. Thankfully, it was still under warranty. All is well now, at least with one of my vehicles. Should call them Don't a last. You'd think at their prices you'd get quality. Not. At least the warranties are solid, most parts are lifetime. This is the first real issue I've had with Duralast parts, or I suppose it was two issues at once. Would've saved a lot of headache if the switch worked the first time, it's too easy to discount a part as being the issue because it's brand new and *should* work.